A sixth-plate ambrotype shows a First-Sergeant from Massachusetts wearing a battle pin which features the photograph of his commanding general. The editor turned his column over to the Executive Director of the Gettysburg Battlefield Preservation Association, Dr. Walter L. Powell, who is concerned about the possibility of land adjacent to remaining battlefield areas being taken over by development. He encourages readers to contact their legislators in support of H.R. 797 (“The Taney Farm Bill”) to preserve that land and force a geological survey to determine final boundaries for preservation at Gettysburg. One of several letters to the editor requests readers to help provide more information about one of his images, which appears to show a soldier with an embroidered 8th Corps insignia on his kepi. Another reader complains about an anti-gun control ad, requesting that political issue ads be avoided in the future; the editor suggests that the ad be ignored if it disturbs. A reader suggests an article on WW1 balloons, and is told that Military Images stopped publishing First World War articles about a year previously as there was not enough support for them by the readership. Three publications are set for review in this issue of MI. First is General A.P. Hill: The Story of a Confederate Warrior by James I. Robertson. The reviewer considers this to be a valuable biography of one of Lee’s important corps commanders, and feels that Robertson pointed out Hill’s weaknesses as a commander fairly. One point, however, that the reviewer makes is that an image purportedly of Hill in the 1850s shows a man in a naval, not army, uniform. Next is Henry Hopkins Sibley: Confederate General of the West by Jerry Thompson, which outlines the career of the man who is most remembered as the inventor of the Sibley tent. His story is much more than that. Hoping to gain quick advancement in the Confederate army, Sibley used his connections to Jefferson Davis to formulate a plan to raise an army in Texas and capture New Mexico and the precious metal fields of Colorado. The biography describes how and why this plan did not succeed. Finally, there is a lengthy review of Nothing But Glory: Pickett’s Division at Gettysburg by Kathleen R. Georg and John W. Busey. It is an interesting look not at Pickett’s Charge, but at his Confederate troops and their actions in and reactions to the charge. Using a number of previously untapped primary sources, Georg follows the men into the conflict, and like many of them, wonders where General Pickett actually was. Busey’s contribution lies in statistical evidence, along with rosters that outline each name and what the result was for each. The volume is highly recommended. Eighteen different images illustrate the last type of badge discussed in this series of articles: the identification badge, a probable precursor to the “dog tag” worn in later conflicts. Generally made from stamped brass and often coming in three separate parts, soldiers could order these badges in order to identify themselves in the event of their death in battle. Some of the unique badges, similar to the one on the front cover of this issue of Military Images could include a small photograph of a famous politician (one thinks of the election of 1864), a commanding general, or even the soldier’s sweetheart back home. Some of the images show these identification badges in combination with Federal Corps badges. Some of them are in their complete three piece form while others are missing pieces and the soldier had to improvise how to attach them to their uniform. A few of the images show soldiers wearing badges on their outer coats and on their vests, perhaps to insure their identification should they be wounded or killed. The daguerreotype shows a large brick building with a full complement of soldiers, officers, and band members wearing elaborate uniforms that included white trousers and white plumes in their hats. They stand at present arms before a line of trees. The image, not published previously, was found in the estate of Mrs. Estelle Brady of Statesville, Iredell County, North Carolina and that is where researchers began to try and identify the group. 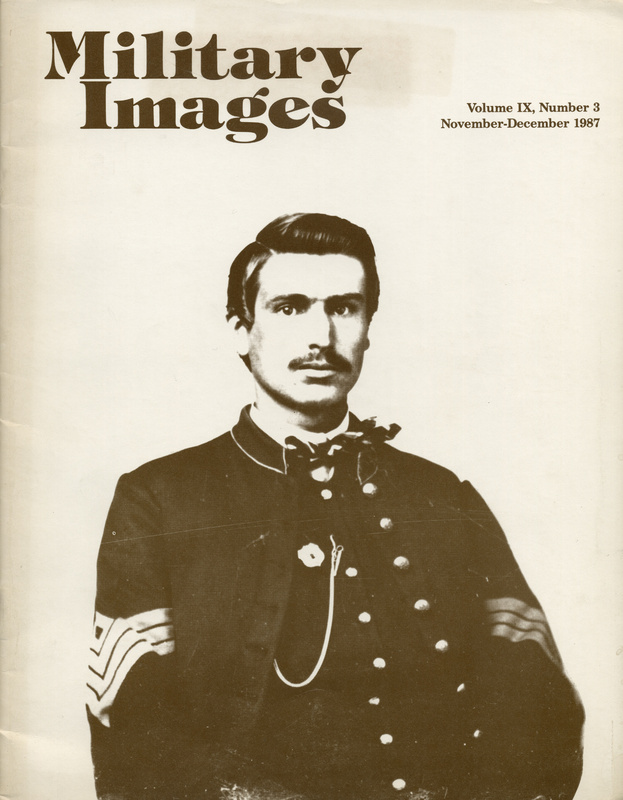 The article describes the various hints that the daguerreotype provides and gives the readers a very rare look at an identified antebellum Southern militia. Major General Philip Kearny had a long and storied career in the Federal Army. He lost an arm fighting in the Mexican War, and with the French Army fighting in Italy, he was awarded the Legion of Honor medal in 1859. Killed at the Battle of Chantilly, Virginia in September 1862, Kearny rode straight into a Confederate line of battle that he had not been able to see clearly during the heavy rainstorm. He was called to surrender, but Kearny chose to turn and attempt to escape. His subordinates wanted to design and award a fitting remembrance for General Kearny, and devised what became known as the Kearny Medal, which was awarded to only 320 officers, five of whom are shown in images wearing the Medal. Kearny’s successor, General David Birney ordered the creation of the “Kearny Cross” which was different in design and presented to 463 noncommissioned officers, privates, and two vivandieres. Marines shown in this pictorial article served all over the world, from Guantanamo Bay to the Philippines to Samoa with their Fita Fita Guard. Their uniforms changed with linen summer dress shirts to the more common olive drab or khaki colors that we associate with Marines today. The collection of photographs includes individual portraits along with units posing for the camera as groups. This “holiday potpourri” of the regular “Stragglers” includes a large carte de visite taken by Mathew Brady of members of companies C and D of the 21st New York Infantry in Virginia in 1861, with identification of the individuals in the image. Another image shows surviving members of the 8th Illinois Cavalry; one of their number fired a shot at a Confederate officer, setting off what became the Battle of Gettysburg. Two post-war cartes de visite show young boys in uniform, one with a surplus Maynard carbine while the other shows a young soldier in kepi driving a dog pulling an “Express” wagon. Other images include an ambrotype of a mounted militiaman wearing a tricorn hat and a cabinet card of soldier wearing an unidentified badge. A total of fourteen images are included. A sixth-plate ambrotype shows a Confederate wearing his battle shirt, dating from the early years of the Civil War.